Many people believe that pretzels have a history in prayer. 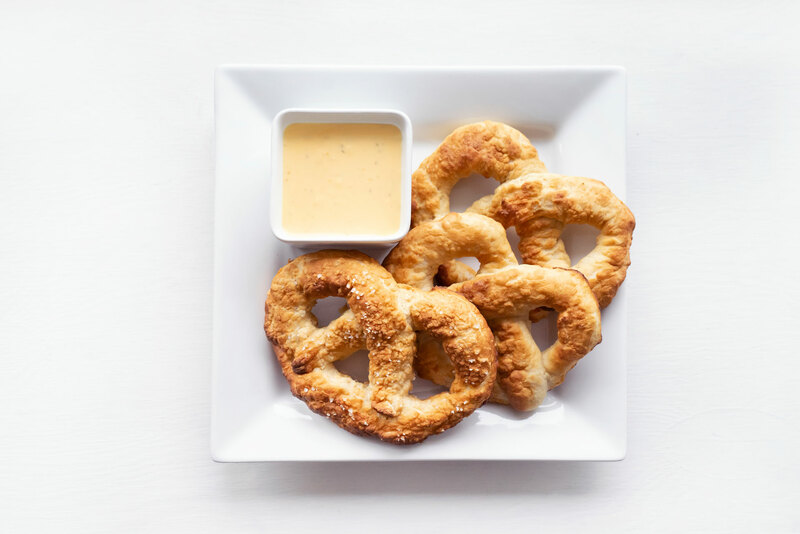 It’s often noted that pretzels were invented in 610 A.D. by an Italian Monk. The monk created these baked treats as a way to reward young children for learning their prayers. Some say that he folded the strips of bread dough to resemble the crossed arms of praying children. They were originally called pretiolas, which means “little rewards”. Meanwhile in Germany, many believe that the three holes within a pretzel represent the Trinity: God the Father, God the Son, and God the Holy Spirit. 1. Warm the milk in a saucepan to about 110 degrees (roughly the temperature of a hot shower – hot, but not scalding – nobody wants to be burned!). 2. Pour warmed milk into a medium bowl and sprinkle in the yeast. 3. The yeast will take about 2 minutes to soften, once softened, stir in brown sugar and 1 cup of flour. 4. Soften 2 tablespoons of butter and stir into the bowl. 5. Add the rest of the flour – about 1 ¼ cups, and the 2 tablespoons of the fine salt to make a sticky dough (sticky enough that if kids are helping you’re probably warning them not to touch anything else right now). 6. Lightly flour your kneading surface then place the dough onto the surface and knead until smooth –but still slightly sticky. Don’t forget to use the flour as needed. This step should take about 5 minutes. 7. Roll the dough into a ball (doesn’t need to be perfectly round – so all you perfectionists should just relax). 8. Lightly grease a bowl and place the ball into the bowl and cover with plastic wrap. 9. Let the dough proof by placing the bowl in a warm spot. The dough should double in size –which will take about an hour (kick back, relax – read something fun and if anyone asks, tell them you’re baking to perfection). 10. Preheat oven to 450 degrees. 11. Grease a large baking sheet with your extra butter. 12. Take your bowl, take off the plastic wrap and punch your dough to deflate it (how often are you told to punch something?). 13. Once deflated, turn out your dough onto a lightly floured surface… if your dough seems tight, cover it back up and let it rest until it relaxes (we all need a break – sometimes even dough!). 14. Divide the dough into 6 pieces. 15. Using your hands, roll and stretch each piece into 30” ropes –you can hold the ends and slap the middle of the rope on the counter as you stretch it. 16. Once your rope is ready, form it into a pretzel shape. 17. Dissolve baking soda in 3 cups of warm water in a shallow baking dish. 18. Gently dip each pretzel in the soda solution then arrange on the prepared baking sheet and sprinkle with the coarse salt. 19. Bake at 450 degrees until golden – approximately 10-12 minutes. 1. In a small saucepan over medium heat, melt the butter. 2. Slowly whisk in the flour. 3. Whisk constantly and let cook for about half a minute. 4. Slowly pour in the milk and continue whisking until there are no lumps of flour. 5. Simmer the milk for about three minutes as the sauce thickens. 6. Add the cream cheese, stirring until mixed and then remove the pan from the stove. 7. Add the cheddar cheese and stir until melted. 8. Add salt to taste.